The four top woodsball teams in Atlantic Canada gathered to battle for the ATWL Cup, and bragging rights as the Atlantic Tactical Woodsball League Champion. Teams advanced from the first playoff round to event four and a battle for the championship represented fields from across the region; Mersey Road Predators from Mersey Road Paintball, Nova Scotia Mercenaries from Splatter Island Paintball, Team Anthraxx from Hypersportz Paintball, and the Strict Union Militia from Mission Paintball. The day started with Anthraxx going up against the SU Militia. All season both teams played an aggressive style of paintball so the first match up was expected to be a high scoring affair. An ATWL match consists of the teams playing two 20 minute games. The teams play, switch start points for the second game to eliminate any advantage in the field layout. Teams fight for three capture points. Five points are awarded for every minute a capture point is held with a 25 point bonus for holding the center capture point at the end of the game. The Anthraxx and SU Militia match lived up to expectations. The teams gave their all and each won a game. Anthraxx came out on top of a 310 to 245 capture point score and advanced to play for the championship with the SU Militia battling for third. The next match of the day was the regular season winners Predators against the Mercenaries. The outcome of this match would to decide who would play Anthraxx for the Championship. The match was a closely fought affair with the Mercenaries winning both games by a slim margin. The afternoon matches were set, Predators against the SU Militia for third place and Anthraxx would play the Mercenaries for the Championship. The Predators returned to their regular season form in the afternoon match winning both games to capture third place. Anthraxx continued their aggressive play, won both games against the Mercenaries to be crowned the Tippmann X7 Phenom - Atlantic Tactical Woodsball League Champions. The Tippmann X7 Phenom Atlantic Tactical Woodsball League (ATWL) is excited to announce that, for the first time in league history the league is expanding outside Nova Scotia. The ATWL has come to an agreement with Mission Paintball and Outdoor Adventure in Moncton, New Brunswick where ATWL Event 3 will be played on September 22, 2012. League Commissioner Bruce Johnston couldn't be happier about the move to a neighbouring province. "From its inception the Atlantic Tactical Woodsball League was meant to be a league for all of the players in the Maritimes." Johnston continued "This is the second season teams from New Brunswick have played the league. The support from New Brunswick is there so it makes sense to expand our list of official fields to include Mission Paintball." Josh Gastelum Manager of Mission Paintball and Outdoor Adventure was glad an agreement could be reached and the ATWL brought to Moncton. "We feel that the Atlantic Tactical Woodsball League is making all the right moves in both the format of play and the expansion to New Brunswick." Gastelum continued "We hope that this is the first event of what will be a long relationship between the ATWL and Mission Paintball." Mission Paintball has long been a hot spot for tournament play, producing some of the best players and teams in the region including the 2011CXBL Eastern Conference Champion Strict Union. Moving toward a tactical /scenario play is new for Mission, but the scenario field created will make for new and exciting play for ATWL teams. Josh Gastelum is sure the players of the ATWL will enjoy the new field, "We are thrilled to have the opportunity to showcase our dynamic urban village to the players of the ATWL. The environment we have created is like nothing the players have encountered in Atlantic Canada." The ATWL is currently in the sixth season of play. The league has proven its value to the players, because of the stability brought by a dynamic management team who are willing to listen to and give the players what they want. 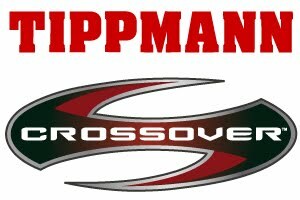 Thanks to the generous support of Tippmann Sports, PBL Action Sports, the team owners and most of all the players, the Tippmann X7 Phenom Atlantic Tactical Woodsball League is excited to expand to Mission Paintball in Moncton and become a true league of Atlantic Canada. Hypersportz Paintball (formerly Overkill Sportz) has been taken over by a new owner who is making considerable field improvements. Teams that are visiting Hypersportz for the first time since last season were very impressed with the changes. Thousands of dollars invested by the new owner in improved drainage, clearing firing lanes, leveling the ground and reposition bunkers will make the field play faster and put a premium on communication plus coordinated fire and movement. Often the first game can set the tone for the entire day. The cold rain didn't dampen the excitement as the Nova Scotia Mercenaries went up against the SU Militia. The fighting was so fierce that at times it seemed there were more paintballs in the air than rain drops. If this game was an indication event two would be an exciting day. As the day wore on, the weather improved but there was no improving on the already top notch paintball. The matches between current and former champions, plus epic battles between two new teams to the league all the games were back and forth fights went down to the wire. The SU Militia from Moncton, New Brunswick went on a tear at event two. They kicked their game up a notch since event one, and were the team to beat at event two. The Militia won all four of their games with a total combined 790 flag capture points. Another surprise of the day was the improved play Green Acres Goblins. First year teams in a very competitive league can sometimes get overwhelmed. The Goblins showed they were able to adapt their play and fight toe to toe with the best teams in the region. No one team is breaking away from the pack. The top of the leader board is tightening. The new teams are improving quickly. The 2012 Tippmann X7 Phenom Atlantic Tactical Woodsball League has reached the half way point and who will be crowned champion is anybody's guess. This may turn out to be the most exciting finish in ATWL history. The ATWL has a simple point scoring system. Points are scored by capturing one of three flag stations that are set up approximately equidistant to each team’s start point on the field. To ensure fairness, and overcome any possible advantage due to field layout, all teams play, switch end of the field and play again. The team with the most capture points at the end of each game wins. The defending champion Mersey Road Predators are intent on defending their crown. The Predators once again have a very experienced squad which should be the team to beat. Former ATWL champions Anthraxx (2010) and Mercenaries (2009) will not let the Predators simply walk away with the ATWL Cup. Even though the Predators have a strong team they will have to play their best to get past the former champs who are as eager to repeat as champions as the Predators. The first game of the season featured the new to the league Green Acres Goblins up against the defending champion Mersey Road Predators. The games were exciting to watch and a true deep end of the pool experience for the Goblins. Playing the defending champions in the first game of the season was a bit of a shock, but the Goblins now know what parts of their game need to be tweaked before event two at Hypersports Paintball on June 9th. Once again the province of New Brunswick entered a team keeping the ATWL a true Atlantic Canadian league. The SU Militia from Mission Paintball in Moncton New Brunswick came into the league with the intent of taking the ATWL Cup to a new province. The SU Militia do have a paintball pedigree and are the woodsball division of the tournament CXBL and NPPL Moncton Strict Union team. The SU Militia team has some of the most experienced and talented paintballers in Eastern Canada that will battle hard for every point. "We have a strong field of teams this year." said Tippinators Captain and ATWL Commissioner Bruce Johnston. "We have experienced teams mixed with young guns eager to make their mark on the Atlantic paintball scene." Players and fans have said they want to know game results as soon as possible. To push as much information as possible out to players, the league is once again using Facebook for updates. Game scores, play updates, and updates in real time posted on the ATWL Facebook Page. Go to Facebook, 'Like' the league and you will be kept up to date on scores and action, as it happens. If the athleticism and paintball skills displayed by every team at event one is any indication, the 2012 Tippmann X7 Phenom Atlantic Tactical Woodsball League championship is up for grabs. The parity of the teams in the league coupled with the steady progression of individual player skills will make this woodsball season the most exciting ever. The Tippmann Crossover is a sleek, lightweight, center fed m arker that embodies woodsball durability with tournament speed and agility. The marker is smaller than any other made by Tippmann and is of comparable size to other tournament markers. As they have done so many times in the past Tippmann is set to redefine the gold standard in paintball markers again, with the Crossover. At the core of the Crossover is the proven FlexValve. FlexValve Technology makes the Crossover the first electro-pneumatic speedball style marker to offer the winning combination of improved air efficiency, superior accuracy due to the spool valve design, manual or electronic mode firing, and the flexibility of CO2 or High Pressure Air (HPA). Although the Crossover will work on CO2 it needs to be setup properly, such as using a remote line and using a low rate of fire so marker internals do not freeze. The ruggedness of the FlexValve and the ability to operate below 300 PSI will give all players the competitive edge on the woodsball or speedball field. The low operating pressure greatly improves air efficiency allowing you to get up to 1,400 shots from a 68 cubic inch 4500 psi tank. The Crossover’s searless trigger design incorporates fewer parts to wear, making maintenance easier than ever. Because this new marker is built around the existing Phenom internals and can accept an A5 threaded barrel the look may be a little foreign to die hard Tippmann users but the feel, reliability and performance are undoubtedly Tippmann. Like the Phenom the Crossover has a lightweight aluminum body with internal gas line and no cocking handle. Unlike the Phenom the Crossover has sleek lines with custom body milling and all excess metal shaved back. Like other tournament markers the Crossover is a center feed and comes with a clamping feed neck that will adjust to fit any loader without tools. The center feed system also uses beam break style eyes to prevent ball chopping and dual ball detents to hold the most brittle paint without barrel breaks. One thing players will immediately notice about the Crossover that makes it different than any other tournament marker is a manual thumb safety on the left side of the receiver body with three settings; Safe, Semi, Electro. As the name implies Safe prevents the marker from firing. Semi means the marker will fire one shot with each pull of the trigger, because of the FlexValve Semi will work without a battery in the marker. Electro setting activates the markers electronics. The stock board will fire up to 15 balls per second, full auto, PSP, NXL, response and three round burst. A single button on the back of the grip is used to program the board or turn the eyes on and off. 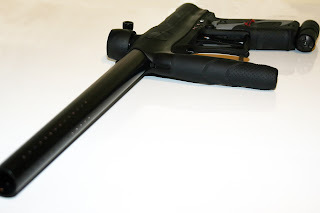 In the past, Tippmann markers have angled the Air Source Adapter (ASA – the thing the tank screw into) at an angle so liquid CO2 would not be drawn into marker when fired. 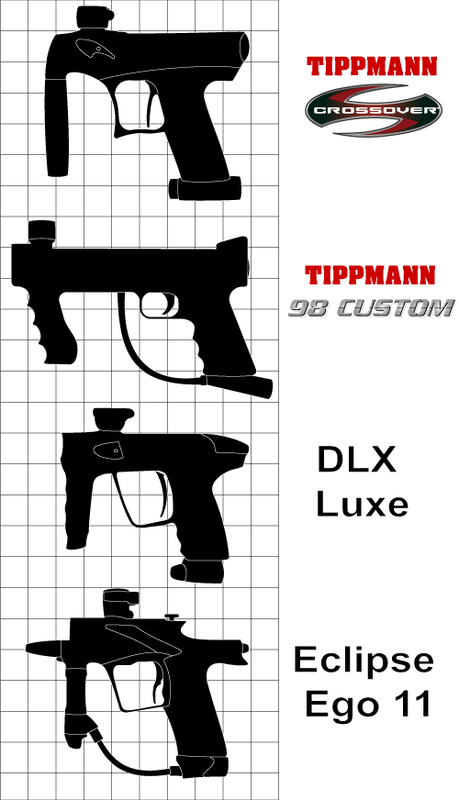 The Crossover is the first Tippmann marker to have a 90 degree ASA that brings the marker down to eye level and in closer to the body when shouldered. The Crossover will run on CO2 or HPA. Most HPA tanks put out 800 pounds per square inch (PSI) pressure, because the Crossover operates at 300 psi Tippmann has designed an ASA that regulates the pressure from the tank down to a useable level for the marker. To lighten the marker the regulator for the Crossover is built into the ASA with a velocity adjustment on the front of the regulator. The engineers at Tippmann have thought of players who want to degas the marker when not playing but not remove the tank. With the Crossover players have the option to remove the factory installed regulator ASA and front grip and install a vertical regulator and on / off ASA. In only minutes with a few off the shelf parts and a macro line the unique appearance of the Crossover can be changed to look like more traditional tournament markers. Unlike other high end tournament markers the Crossover has kept woodsball players in mind. The gap between the front grip and trigger guard is wider to leave room for gloved hands. The same is true of the oversized trigger guard that allows players to easily roll the trigger while wearing bulky milsim gloves. For more than 25 years, Tippmann Sports has been dedicated to quality manufacturing and the pursuit of cutting-edge technology and design. The company serves the paintball industry from its headquarters and manufacturing facility in Fort Wayne Indiana. Tippmann Sports’ complete line of paintball markers and related accessories can be found at paintball stores and fields as well as mass retail and sporting goods outlets throughout the world. There will be an Atlantic Tactical Woodsball League information meeting Saturday January 28th at 2:00 at Henry Schein, 2 Bluewater Rd Bedford, NS. If you are interested in entering a team, or just interested to see what the league is all about we would love to see you there. The 2012 Atlantic Tactical Woodsball season will be here before you know it. Once again Mersey Road Paintball will the official field of the ATWL and will play host to the season opener and championship.